When it’s too hot to hike but there is a nice, cool breeze out on the lake kayaking is our go-to activity…and of course Tansy and Crockett come along! Kayaking can be a lot of fun for both you and your dog but there are a few steps to follow to ensure a safe and enjoyable time (for both of you)! While the thought of kayaking with your dog is exciting and many dogs love it, be sure to stop to ask yourself if your individual dog will enjoy it. If your pup would be happier to be at home snuggled into the couch, that is OK! 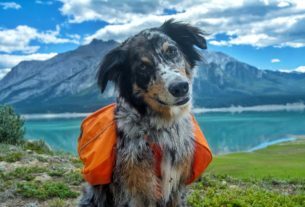 If your dog is nervous of the water or of the kayak it doesn’t necessarily mean they can’t ever kayak with you— but you might need to put in a little bit more time and work with them to teach them to enjoy it! Both Tansy and Crockett don’t like to swim but still enjoy the kayak! On the other hand, if your dog is super excitable and isn’t always able to follow cues such as sit & stay, you might need to brush up on their obedience before heading out to the lake! Dog Life Jacket: Even if your dog is a strong swimmer, a life jacket is always a good idea. If your kayak capsizes the last thing you want to be doing is worrying about and trying to help your dog. Plus, the handle that is attached to most life jackets makes assisting your dog into and out of the boat much easier! 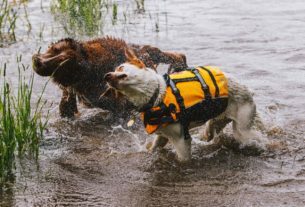 We use the Ruffwear Float Coat and are really happy with it, but there are a lot of options, click here to find out Which Life Jacket is Best For Your Pup. Portable Dog Bowl & Fresh Water: It can get hot on the kayak and you’ll need to keep your pup hydrated! Yes, your dog might usually drink from the lake or river but the water isn’t always safe to drink and we have also found that Tansy and Crockett can’t quite reach the water from the kayak. Leash: You’ll want to bring a leash for when you are on land and loading/unloading from the kayak. It is also a good idea to bring an extra one and keep it in your pack in case you lose a leash if you capsize. We have been testing out Petoji’s Ultralight Biothane Leashes and they are perfect for kayaking. The small size easily tucks away in our kayak while we are out on the lake and the waterproof biothane has been great—no more walking home with soggy leashes! *Never tie your dog to the kayak! This can be super dangerous if your kayak capsizes* It’s best to leave the leash off your dog as it can tangle, but if you do need to leash your dog (we sometimes do if we are too close to shore and Crockett looks like he might jump out) attach the leash to either the life vest or a harness rather than a collar and hold the leash in your hand rather than tying it to the kayak. Mat/Pad: We have found that lining the floor of the kayak with a mat or pad will allow your dog to get better traction and feel more secure in the kayak— this helped Tansy get used to the kayak SO much faster! Sunscreen: If your dog is prone to getting sunburned be sure to apply or bring along dog sunscreen! Begin by introducing your dog to the kayak on land, this is especially important for dogs who can be more timid of new things. Tansy was initially nervous of the kayak and wanted nothing to do with it but with a couple 5 minute training sessions around the kayak she began to relax. 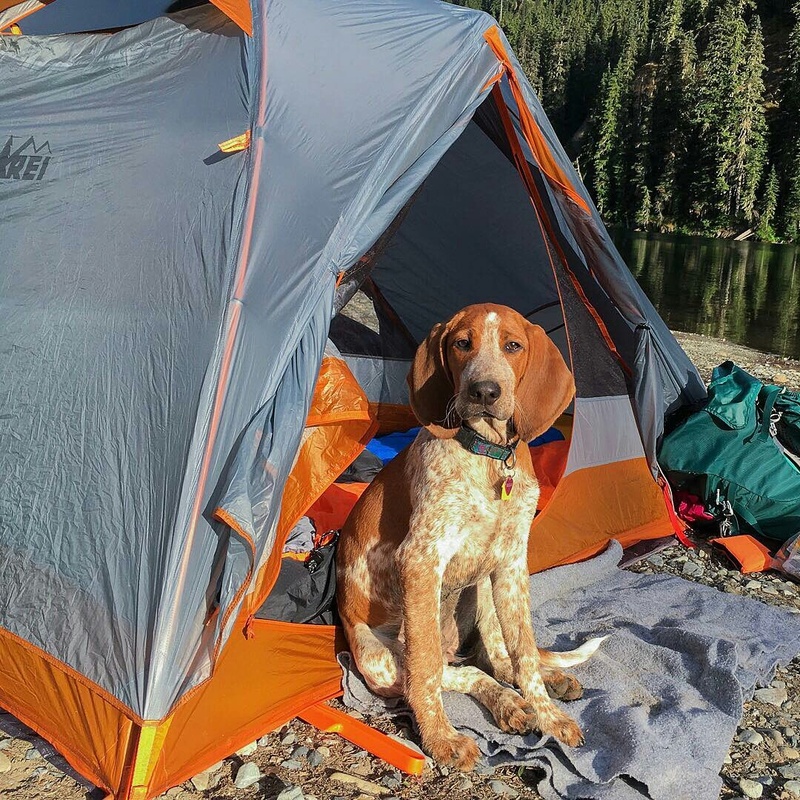 Allow your dog to sniff the kayak and explore it on their own terms. If your dog is nervous around it, reward/praise them when they step towards it or sniff it. When they seem relaxed around the kayak give them a cue to get in (we use “hop up”, which both Tansy and Crockett already knew from car rides). If you don’t have a cue, encourage them to get in by getting into it yourself or tossing a few treats into it. Once your dog is happily hopping in and out of the kayak on cue, you are ready to put it in water! Get into the kayak first in calm, shallow water and then cue your dog to get in, your weight will make it a bit more stable. Give them praise/rewards for getting in and allow them to jump back out if they want to. Your dog won’t be used to the kayak moving under them and this can make them uneasy. Be patient with them as they get used to the new sensation. On your first few outings with your dog take short trips to get them used to it and make them fun! For Tansy that means paddling close to ducks and seagulls to keep things interesting and for Crockett it means making a stop up the lake to stretch his legs and run around. For others it might mean swim breaks or fetch in the water! Kayaking with your dog should be a fun adventure together – if it isn’t working don’t be afraid to call it a day and try again when you will both enjoy it more. 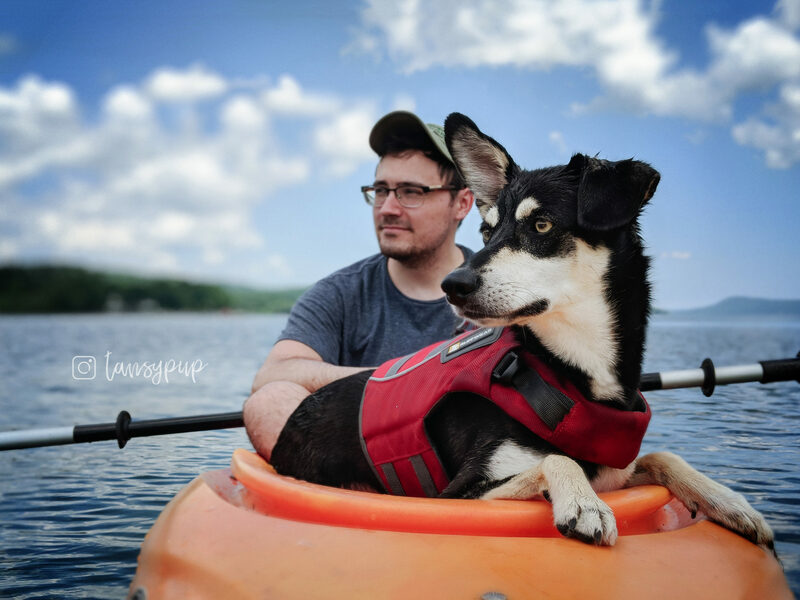 About the author: Tansy and Crockett enjoy exploring upstate NY with their humans – check them out on Instagram @tansypup to see their adventures!